The Leaning Tower of Pisa is one of the most famous (and touristy) monuments of Italy. Its beauty is universally acknowledged and honestly it is a quite a sight when you first see it because it leans (duh)!! The fact that it defies gravity is something very interesting. The stark white color of the tower is splendid and gives a gorgeous feel to the whole square known as “Piazza dei Miracoli” (Square of Miracles). The square proudly boasts a cathedral, a baptistery and a cemetery. 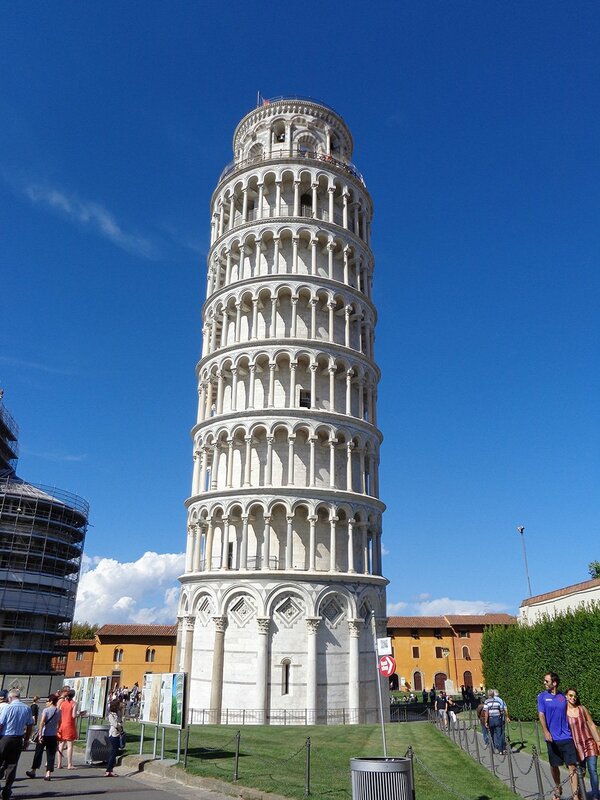 The Leaning Tower of Pisa is worth visiting if you are in Italy but the thought of climbing top of the leaning tower (296 steps) to see the town of Pisa is not for everyone. Not only is it very costly at a whopping EUR18 but it makes you feel dizzy. Also, children below 8 years aren’t allowed to climb so note that. Anyhow, if you are brave to spend that money, go and feel the “lean” during the climb of 296 steps. Once you reach the top, the town of Pisa looks exceptional! Despite the beautiful views from the top, I found the ticket to be insanely priced. I’d rather recommend you spending time in the piazza below at a Bar or at the lush green lawns and relax with a book and vino. Hopefully I’ll get tickets to ascend the leaning tower. Love this! Will had Pisa to my list! Thanks so much for sharing. Awesome photos!!! Love it!!! I admit Pisa is super touristy…but we loved it! The kids went nuts there….any news on a possible visit in October? I’ve talked to people who didn’t like Pisa because of the crowds of tourists. But I thought it was well worth a visit — and a climb to the top. The tower itself was actually more beautiful in person that I’d expected, too. I agree Cathy. There were a lot of tourists but we know why. Pisa is such a charming town and you are right, the tower is stunning! Would you believe that I have lived for a year in Pisa and I never went up the tower? 😀 15 euros (at the time) seemed a bit too much and I was afraid I would feel too dizzy and get down, so I was just afraid of wasting my money. But the view of the Piazza from the top must be really worth the spinning head. Yes it is worthwhile and I can’t do it now. This was few years back. I think I felt the price was a bit too steep too. It is quite pricey indeed, but if you think the money goes into maintenance of a building that has been defying gravity for 500 years then it makes a little more sense. Still, I was in Pisa as a poor student and had other priorities XD But I love Piazza dei Miracoli ever since I first visited it at 9. Absolutely. I agree. Yes it’s absolutely gorgeous.